The Antique Marks glossary covering Antique Terms D. Everything from dagger to duesbury and derby to dresser. Below you will find antique related words or antique terms begining with ‘d’ covering everything from dagger to duesbury and many more that you might find useful. The list of antique terms is not exhaustive but we will add to it as time goes by. The descriptions detailed are only intended to be relevant to how the word or term relates to antiques and although the same word may have other meanings in other contexts, we have not and do not intend to detail those meanings here. In some instances we have included pictures to enhance the meaning of the word or antique term and we have also tried to index each word in order that you may click through to the explanation when the word or term appears in other pages on the site. The abbreviation for a british pre-decimal penny. A short bladed weapon, usually double edged for thrusting, parrying and stabbing. The first practical photographic process invented in 1839 by french painter and theatrical designer Jacques louis Daguerre (1789-1851). It produced a positive image formed of tiny globules of mercury on a silver coated copper plate. The daguerreotype could only be re-produced by being re-photographed, and exposures took up to thirty minutes. It was superseded by the calo-type process. Meaning, matching japanese swords or a sword and dagger, popular from the 15thC and from the japanese words ‘dai’ meaning long and ‘sho’ meaning short. The process of setting contrasting pieces of fine metals into a metal body such as the blade of a sword or a casket for the purposes of decoration. Originally developed in damascus and was adopted in europe during the 17thC. Gold, silver or copper wires are inserted into fine grooves cut into an iron, brass or bronze body and then hammered into the surface. European craftsmen applied the decorative metal superficially on a cross-hatched or toothed surface which wore away easily and was known as counterfeit or false damascening. A reversible fabric used for table linen, curtains and upholstery. Damask was originally woven in silk and later in linen, wool and man-mad fibres. Its characteristic appearance is due to upper and lower surfaces of the same weave forming the pattern and the tonal variations. Damask set with gold, silver or coloured metallic threads is known as damassin. Red or plum coloured damask was imported from italy until the late 17thC. when production began in the UK. Red and blue damask was popular for window curtains and upholstery throughout the Georgian period. The dutch pioneered linen damask for luxury tablecloths and napkins in the 15thC. From the 17thC. germany and ireland became increasingly important producers. Netting with a pattern or design embroidered into it to create a lace effect, popular from the 16th to early 17thC and late 19th to early 20thC. Also known as lacis or filet. A glass factory run by the brothers auguste (1853-1909) and antonin (1864-1930) daum in 1875 in nancy, france. Well known for art nouveau and art deco vases and mushroom shaped lamps. A small desk with a sloping writing surface and four drawers set sideways into the base beneath. The first recorded version of the design is of a desk made for a captain davenport, in the late 18thC. Probably for use at sea. There are many variations of the basic style. 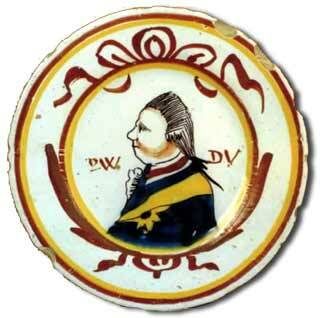 A porcelain and earthenware factory founded by john davenport at longport Staffordshire in 1794. Produced bone china from c1800 as well as tea services which often closely imitated derby decoration. Ornamental articles were more individual to davenport and featured monochrome and multi-coloured landscapes and skilfully painted flowers and fruits. Production declined in the 1870’s and the factory closed in 1887. The term for an upholstered couch or sofa, from the 16thC, with a sloped backrest at one or both ends and used for resting or reclining during the day. The sale of an item originally donated to a museum or gallery, in order to raise funds. The dutch silversmith who became the leading london silversmith of his time. In 1716, appointed goldsmith to King George I. De Lamerie’s early work c1713 includes domestic silverware in queen anne and huguenot styles. In the 1730s, launched a more flamboyant rococo style, especially in large cast and embossed pieces. In the 1740s, returned to a more restrained style of decoration. His work includes flatware, wrought silver and wine cisterns. A glass bottle with matching stopper used to hold and serve wine, whisky, rum, brandy or other beverage. French ceramics artist noted for his brightly coloured earthenware and naturalistic motifs inspired by Japanese, Chinese, Turkish and Egyptian art. In 1861 he introduced his bleu de Deck, a turquoise glaze. During the 1870s Deck produced japonaiserie style plates and vases, and in the 1880s worked in porcelain using flambe glazes. In 1887 Deck became administrator at sevres. French glass artist who produced art nouveau and art deco decorative wares and was a leading exponent of translucent pate de verre glass. The centre for tin-glazed earthenware in Holland from the mid- 16th to mid-18th centuries, which profoundly influenced the course of European ceramics. Delft potters and decorators finally established the move away from Italian maiolica styles and colours towards the blue and white colour schemes and decorative techniques of chinese export porcelain. Factories elsewhere in Europe followed suit. By the mid-17thC, Delft was making vases, plaques, tiles for wall panels, house and shop signs, and table services.The addition of a lead glaze, known as kwaart, enhanced the brilliance of the colours and gave a glossier finish closer to that of Chinese porcelain than achieved on English delftware. Gradually, an individual Dutch style emerged, incorporating landscapes based on the paintings of contemporary Dutch artists, and Oriental designs were adapted to vases and ornamental ware in typically European shapes. The name given to British tin-glazed earthenware. Following the Dutch lead, British maiolica in the Italian style was introduced in the mid to late 16thC, principally at Southwark and Lambeth in London. But it was the emulation of the delft approach to Oriental styles, with Dutch-style landscapes, and from 1690, the use of a second, lead or kwaart glaze, that characterised delftware. Barrel mugs, jugs, wine bottles, chargers and bowls were typical products. The body of English delftware was softer, the finish less glossy, and the products less refined than their Dutch counterparts. Most delftware was decorated in blue and white, although high-temperature colours broadened the palette in the early 18thC, especially at the bristol potteries. liverpool and Dublin were also major producers, with a substantial output of transfer-printed tiles from 1750. 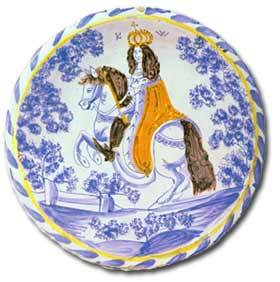 Delftware production declined with the development of the more refined creamware towards the end of the 18thC. Clock-maker noted for his pocket watches, marine chronometers and the construction of the Big Ben clock in London (which was completed by his stepson, Frederick). Dent was in partnership with John arnold 1830-40 and then worked on his own. Small pocket percussion-lock pistol invented by US gunsmith Henry Deringer (1786-1868). System introduced 1842 enabling British craftsmen and designers to take out patents on their original designs. 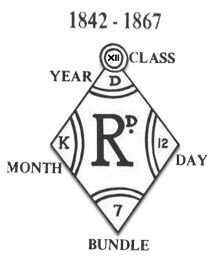 Registered designs are marked with a symbol or number – a diamond-shaped mark was used 1842-83 and thereafter the letters RD followed by up to six digits were used. The marks are not a guide to the date of manufacture as they relate only to the date the design was registered, production of which might continue for many years. Literally translated as German flowers and referring to painted floral decoration which was widely used at porcelain and faience factories throughout Europe. The style was introduced at vienna in the 1720s but perfected at meissen c1740 and later used at worcester, Bow Porcelain and the Chelsea Porcelain Factory. The lifelike flowers, based on contemporary botanical illustrations appear as single blooms or in loose bunches, and replaced the more stylised indianische blumen. A version that incorporated a shadowing effect is known as ombrierte Blumen (shadowed flowers). Group of German businessmen, artists, craftsmen and industrialists who, 1907-34, were influential in setting high standards in industrial design. A flat-weave floor covering made in India, typically from pastel-coloured cotton. It is the Indian equivalent of the Persian (Iranian) and Turkish kilim, although these are usually made of wool. The majority of dhurries were made in Indian jails, and exported cheaply and in quantity to the West from the 19thC. However, pre-20thC examples are now quite rare and valuable. The ‘face’ of a clock or watch on which the time, calendar or astronomical information is registered. The term can refer to the whole face or to the individual discs or rings, such as the calendar dial, on which the periods of time are inscribed. Dials first appeared c. 1350. Previously, hours were recorded by a single strike of a bell. A dial plate is the metal plate in a clock or watch which is attached to the front plate of the movement, and to which the metal chapter ring or enamel dial is fixed. Considered the most valuable precious stone. Diamond is the hardest known naturally occurring substance, and refracts (bends) light and disperses colour very strongly. These qualities give the stones great brilliance and fire especially since the 17thC when diamond cutting was developed and improved. The value of a diamond depends on size, colour and the number of flaws. Completely colourless stones are rare; most diamonds are slightly tinged with yellow or brown. Rare red, blue and green shades are known as fancy diamonds or fancies. A diamond’s colour and clarity can be altered by HEAT TREATMENT. Any of various devices used for cutting out, forming or stamping a material. In Coin Collecting and Numismatics, for example the designs on each of the two sides of the blank are struck simultaneously by a pair of dies or punches, either by hand or machine; usually the more complicated obverse die, or pile, is fixed on a solid base, while the reverse die, or trussel, moves up and down. White cotton, simple tabby-weave fabric sometimes patterned, used for bed and window curtains from the late 17th to early 19th centuries and as a dress material in the early 19thC. It was imported from India before production started in Lancashire in the 18thC. With yingqing, the earliest Chinese porcelain wares, dating from the song dynasty (960-1279). Dishes are the most common, but some bottles, ewers and vases have been excavated from burial grounds. Many forgeries have been produced in Hong Kong and Taiwan. French decorative furniture style which peaked during the Directoire government (1795-9). The style was a simplified and austere version of the Louis XVI style. Minimal decoration was used, and Republican symbols – such as the cap of liberty and the fasces (a bundle of rods bound around an axe) – appear frequently on furniture, faience and textiles. The Directoire style merged into the empire period. A long single-edged knife, traditionally used by Scottish Highlanders and still worn by officers of Scottish regiments of the British army. Also – A short dagger with either a straight or curved blade, carried by naval officers in the late 18th and early 18th centuries. Hollow, waisted cylindrical ring of pierced, chased or fretwork silver used to support hot dishes and to protect the surface of tables and sideboards. Dish rings were made from the early 18thC and are erroneously known as potato rings. Medicine cupboard about 9-13in (23-33 cm) high with shelves and racks on the inside of the doors. Trade term for a work of art, normally a piece of furniture in obvious need of repair. The term is also used to describe a wood surface which has become rough and uneven through age, or which has been made to appear older than it is. A long couch or sofa without back or arms and often set against a wall. The word ‘divan’ is Turkish, and both the divan and the ottoman seat (from which the divan developed) are based on Turkish state furniture. Sheffield firm of silversmiths, established in 1806, which became the leading maker and exporter of britannia metal and electroplated wares to the USA in the mid-19thC. Stylised Chinese Buddhist lion (Fo means Buddha), in Chinese mythology one of a facing pair of temple guardians. They are found as modelled figures in painted decoration on porcelain. The Japanese version is called shi’shi. 18thC term for a fringed napkin, named after a London linen mercer by the name of Doily. From the 19thC the term was applied to the circles of decorative cotton or linen placed on serving plates beneath cakes and sandwiches. Marks found on some dolls identifying maker’s name, batch or style number, size or diameter of head, trademark and sometimes the number of components used to make the doll. Such marks are normally only found on dolls made by the most famous and established manufacturers. Where the marks appear on the body varies according to maker and type of doll. Marks on bisque dolls, for example, are usually found on the back of the head. In addition, official registration or patent marks may appear, as follows Déposé or Deponiert – patent application registered, France and Germany, late 19thC; Breveté or Bté – French for patented; SGDG (sans garantie du Gouvernement) – without government guarantee, from 1850; DRGM (Deutsches Reichsgebrauchsmuster) – German, patent registered, from 1909; Ges Gesch (Gesetzlich Geschutzt) – German, patent registered, from the end of the 19thC; PAT and PATd – patented, Britain and USA, from the end of the 19thC. Blown glass cylinder, one end of which is domed, while the base is trimmed straight to allow it to stand upright. Domes were used in Victorian times to protect collections of stuffed birds or animals, arrangements of wax fruit and other displays, and as protective covers for automata and skeleton clocks. Loosely applied nickname for Spanish or Spanish-American 16th-19thC gold coins, in particular the dobla escudo. A Chinese palette outlined in underglaze blue, the design then glazed and enamelled by filling parts or all of the pattern with translucent famille-verte colours; formerly spelt tou-ts’ai. See wucai and sancai. Short-stemmed, small-bowled glass with a heavy foot, used for drinking spirits. Types of dram glasses known as firing glasses were made in Britain from 1740 until the 19thC. They were used for toasts and hammered on a table to make a noise like gunfire. Extendible table with the top divided into three leaves, known from the 16thC. The two outer leaves slide beneath the central one when the table is shortened. A drinking-glass stem that is drawn out as an extension of the bowl when the molten glass is being blown, as opposed to one that is shaped separately and then attached. A type of embroidered fabric in which some of the threads are drawn out to form geometrical or other patterns in relief. It was introduced in the 15thC or possibly earlier. A group of meissen style ceramics produced by factories in the Dresden area of south-eastern Germany in the 19thC. Until the 1970s the term ‘Dresden’ referred to the Meissen factory itself. A sword worn as part of a uniform or regalia and not for use as a weapon, also known as a court or diplomatic sword. A long table, sometimes in the style of a sideboard with cupboard, drawers or open storage space below, and/or open shelves tiered or stepped above. From medieval times, a dresser, or dressing board, was where food was garnished or ‘dressed’ before it was served. Welsh dresser is a term dating from the late 19thC, used to describe a freestanding dresser with cupboard and drawers, and shelves above. Welsh dressers were made from the late 17thC in Wales, Lancashire and elsewhere. British decorative-arts writer and designer whose distinctive style anticipated the concept of the modern movement. Dresser advocated the importance of design linked with function. He began his career as a botanist, but turned to the study of the arts and published Principles of Design; he was art director of the linthorpe pottery 1879-81. Dresser’s designs, often influenced by Japanese style, were applied to carpets, glassware, furniture, pottery and textiles. He designed simple, geometric silverware for elkington, James dixon and Hukin and Heath. A term introduced in the 17thC for a small table with drawers designed to be used for grooming and dressing. In the 18thC, designs incorporated compartments and drawers for a wide range of toilet accessories, and mirrors became standard for the first time. Detached padded seat designed to fit into a rebate on a chair frame, introduced in the late 17th to early 18th centuries. A development of the gateleg table, with one or two leaves which open out, supported on hinged legs, arms or brackets, to extend the surface area. Early table clock with a drum-shaped case often of gilt brass and especially popular in the 16thC. Also – Late 18th or 19thC French clock movement fitted into a brass, drum-shaped case. Large circular table made from the late 18thC through the 19thC, with drawers set into a deep frieze, and supported on a central pedestal or tripod. A variant used for dining, and with a shallower, expandable top is the capstan table; other variants are referred to as library or writing tables according to their purpose. Rent tables, with four drawers for each quarter year or seven weekday drawers and a till set into the table top, were used for rent collection until the early 19thC. Silver, flat-bottomed, cylindrical teapot with a straight spout, flat lid and single handle of wood, popular 17608-90s. Slip-cast porcelain figures made at derby, 1750-5. They are so called because they have an unglazed, dry edge around the base. A printmaking technique in which a drypoint needle is used to score the design directly into the metal plate. Unlike the true engraving process, the metal is not actually dug out and removed, but is thrown to the sides of the grooves, creating slight ridges known as burrs. These hold some ink which transfers to the final print giving it distinctive smudgy lines. Any of various former European gold coins which used the ducat standard set in the 13thC. A gold ducat consistently weighs 3.5 g of. 986 fine gold. A French term for a day bed with a curved back. A duchesse brisée is a version made in two or three parts – including a foot end with a low, curved back and sometimes a stool in the middle to extend the length. flintlock or percussion pistols dating from the 18thC, usually in pairs. French designer of furniture, metalwork, carpets and glass in art deco and modernist styles who specialised in lavish, custom-built pieces and interiors. A mobile stand with two or more tiers of circular trays around a central column on a tripod base with castors. Dumbwaiters were designed to be placed near a dining table for self-service, and introduced in Britain in the 1720s. Cut-out image of a human figure, such as a pedlar, maid or footman, or animal such as a cat, in painted wood. 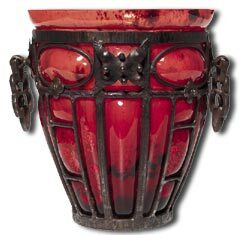 They were possibly used as fire screens in late 17thC Britain, but by the mid- 18thC were purely ornamental. Reproductions were made in the mid-19thC and in the 1920s and 30s. Heavy glass doorstop, also known as a door porter, made of scrap molten glass which would otherwise have been dumped. Bottle factories often made doorstops as a sideline. Pioneering London potter who produced the first identified British stoneware in the 1670s. By the beginning of the 18thC he had developed a greyish coloured salt glazed stoneware and introduced the first fine red stoneware to Britain. Dwight’s influence spread quickly to Staffordshire with the Elers brothers who had worked with him.